What is the Freight Economy? It is an interconnected network enabling the movement of food, energy, fabricated goods, and raw materials to keep citizens employed, communities healthy, and the Nation competitive on a global scale. Together, these components make up the freight economy. Our freight transportation network is one of the great strengths of our country. Millions of Americans wake up in the morning and go to work operating trucks, trains, aircraft, ships, and barges. The system moves 55 million tons of goods worth more than $49 billion each day. In addition, freight supports 44 million jobs. It is a critical force in our economy made up of a vast, complex network of almost seven million miles of highways, local roads, railways, navigable waterways, and pipelines. Watch the Virtual Freight Economy Roundtable that was held October 13, 2016. AIRPORTS 122 Airports landed all-cargo operations greater than 50,000 short tons annually in 2014. Source: U.S. 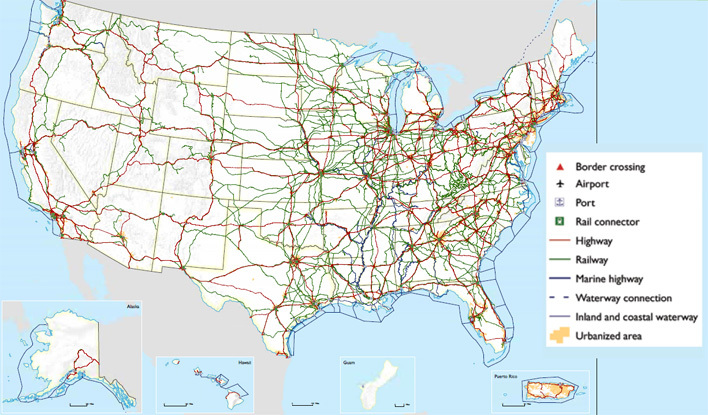 DOT (Comment period for the Interim NMFN (National Multimodal Freight Network) ended Sept 6, 2016 and comments made to the docket are currently under review). In 2014, the U.S. current- dollar GDP was $17.4 trillion, with freight and other transportation-related purchases and investment accounting for 8.9%, or $1.5 trillion, of the total. In 2015, freight-intensive industries generated 47%, or 62.13 million, of 132.2 million total U.S. jobs. Between 2012 and 2045, the U.S. will see freight activity grow by about 50% in tonnage to 17 million and more than double in value to $37 trillion. By 2045, U.S. annual international freight value will reach $15 trillion, representing a 40%, or $6 trillion, freight value share that increased from 20% in 2012. Trucks represent the U.S. predominant freight carrier mode now and into the future. Trucks currently carry 64% of U.S. freight tonnage. Trucks carry the largest shares by value, tons, and ton-miles for shipments moving 750 or fewer miles. Rail is the dominant mode by tons and ton-miles for shipments moved distances that range 750 to 2,000 miles. The top two U.S. commodities by value, electronics and machinery, will reach $8.2 trillion in 2045, representing about a 30% share of the total freight value. Over the next 30 years, forecasters expect the U.S population to grow by about 70 million and the economy to increase by 115% to $36.7 trillion. In 2014, the commercial truck sector lost an estimated $27 billion dollar as the result of highway congestion delays. Nearly 12 million trucks, locomotives, rail cars, and vessels move goods over the U.S. transportation network. Click on map to see individual rountable details. To view PDF files, you can use the Adobe® Reader®.